TEN-YEAR-OLD Rachel Doogue from ‘Springview’, Killeshin Road, Carlow embodies the Christmas spirit. The fourth-class pupil at Killeshin National School decided that she wanted to do something to help the people who, in her own words, “are really ill”. So Rachel hatched a plan. She would raffle her beautiful doll’s house and donate the proceeds to the palliative care unit at the Carlow District Hospital. For any ten-year-old girl parting with her doll’s house is a big deal, but Rachel had no qualms about making that sacrifice. On Saturday 17 November, shoppers at Fairgreen Shopping Centre in Carlow town donated to her fundraiser and, in all, the schoolgirl’s efforts raised a whopping €2,227 for the hospice, about €1,300 coming through donations in the Fairgreen. The balance was raised through ticket sales and personal donations. 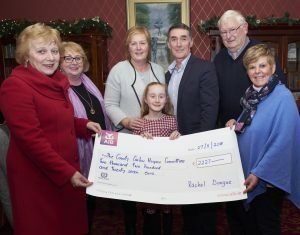 People entered a draw for Rachel’s doll’s house, which was held on Friday 23 November in Graiguecullen Parish Centre, when the winner was Christine Nolan from New Oak Estate. Rachel is daughter of Paul and Elaine Doogue and her dad had a special word of thanks for Diane Hogan from Graiguecullen Swimming Club, who made the cards and posters in helping to fulfil Rachel’s dream.